If you're designing a new custom home or remodeling an existing house, you should consider adding skylights. The versatile options in roof windows allow you to bring natural daylight to those dark halls and bathrooms, or to channel more sun into your main living spaces. Besides allowing some energy savings by needing less electric lighting in the dark areas, what other benefits await you when you install skylights? According to experts, exposure to direct sunlight promotes good physical health. We generate critical vitamin D—which supports immune health in a big way—when we spend sufficient time in the sun. But more than our physical health, it's been proven that natural light plays quite an impressive role in our mental health, as well. Simply having our space lit up naturally helps ward off winter depression, or Seasonal Affective Disorder (SAD). People who work indoors enjoy greater productivity when the lighting ambiance incorporates a lot of daylight. Studies have shown that individuals who view more natural light during the day also sleep better and longer at night. Nothing defines civilization quite like a luxurious bathroom. For obvious reasons, though, bathrooms tend to have the least amount of window openings. With skylights overhead, you can bathe in the daylight and in perfect privacy. Another room well-disposed to a skylight addition for your privacy is your walk-in closet. 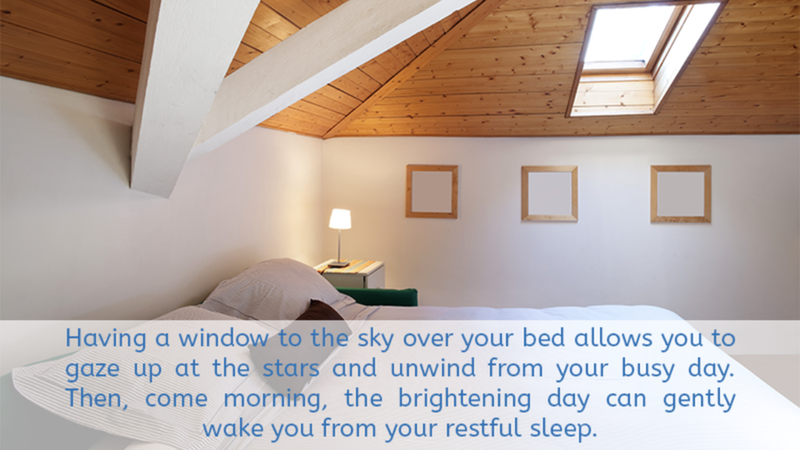 Having a window to the sky over your bed allows you to gaze up at the stars and unwind from your busy day. Then, come morning, the brightening day can gently wake you from your restful sleep. Skylights can be built with electric openers, complete with thermostats and rain sensors. During the hot, muggy days of summer, opening the skylights permits the heat near the ceiling to escape. Should a storm move in while you're away, the sensor will trigger the skylight to close. You can also install a shade to cover the underside of the skylights when the sun is overhead, preventing the rays from adding to the summer heat gain in the home. In the winter, you'll want the extra heat from the sun. With skylights on the south-facing sections of your roof, you can harvest the heat from the sun without exposing your home to the icy outside air. Skylights certainly add interesting design elements within the house, but how do they look on the roof? The answer: great! A row of skylights breaks up vast expanses of roof fields, adding visual interest outside as much as inside. Plus, you are by no means relegated to standard, production-run designs. The Chicago area hosts plenty of skylight manufacturers who can custom-build any light you desire. You can choose basic flat glass or bubble types, geometric shapes, structural (where the skylight is an actual section of the roof) and decorative colored glass. If you can imagine it, someone can build it. From health advantages, privacy, heating and cooling properties and style, skylights add beauty and benefits to your custom home. For more information on all things skylights, NeaMaya is here for you. We can help you plan them in the blueprints of your custom home or add them to your renovation plans. Please contact us to schedule a free consultation today.